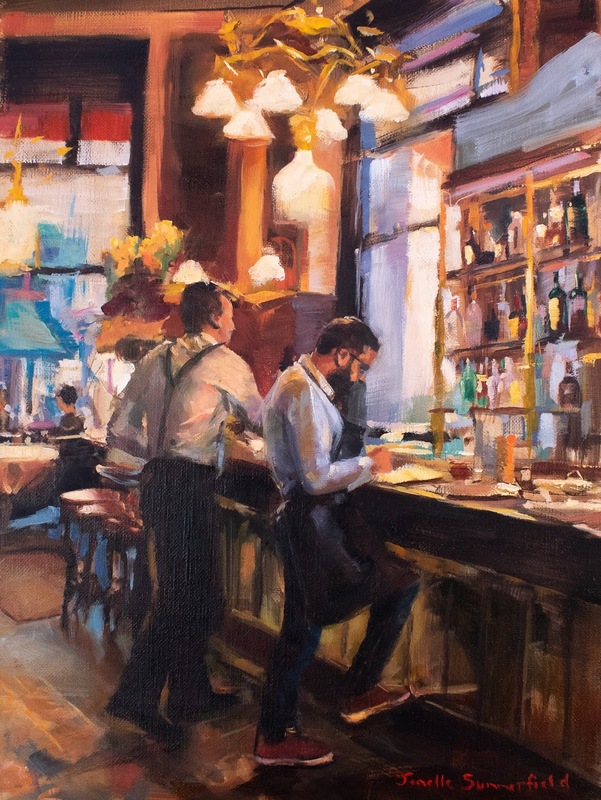 Two waiters fulfilling their orders at a cafe on a busy day in Budapest. Oil on 16"h x 12"w x 1 1/2"d stretched linen. It is the odd hour before dinner in Budapest, and this cafe is not busy yet. Oil on 12"h x 16"w stretched linen. 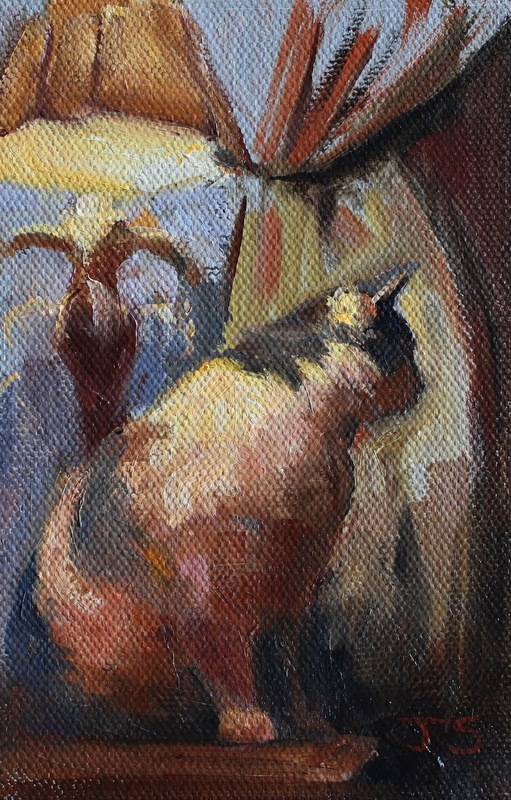 This is my first painting of our new addition, Seuss. We met last summer while rucking in town with some friends. We decided to do a hill ruck with our weighted packs for a tougher workout and suddenly this cat jumped out at us and started following us. I posted it on Facebook later, and found out that the cat belonged to another friend, and she had just gotten her. A few months later, Seuss wasn't getting along with her other cat and she needed a home. After thinking about it, we decided to give her a chance. Though she is small and mostly toothless, she chased my other cats around the house for weeks. Finally they suddenly started to ignore her, and now they co-exist. I'm glad they can keep the peace and am happy to have her to snuggle with on the sofa. I'm sure there will be many paintings of her in the near future! SOLD. Painted from a photo taken near the castle on a very cold day. Oil on 11"h x 14"w x 1 1/2"d stretched canvas. 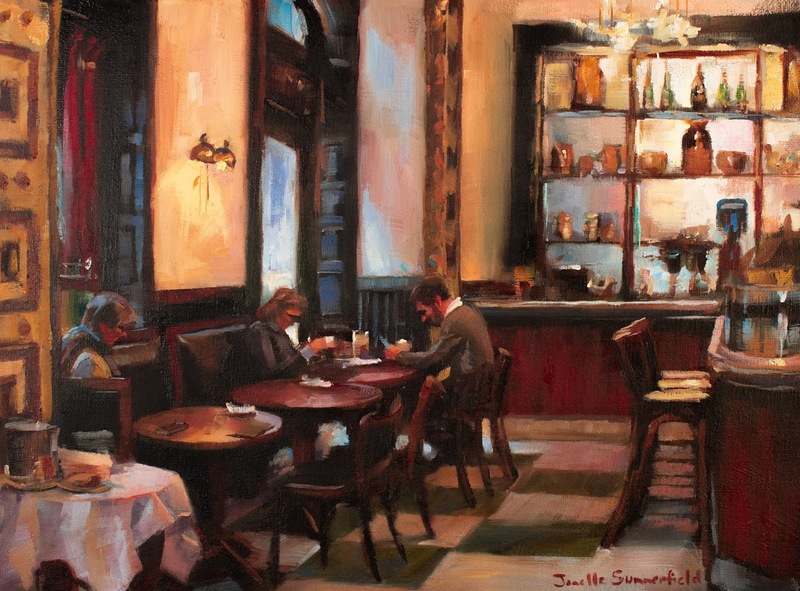 Lunch has ended and only a couple people linger in this cafe in Budapest. Oil on 16"h x 12"w stretched linen. SOLD. This is the view facing north from Washington Square Park in New York City. Several people seem to be walking toward the park on this perfect summer afternoon. Oil on 24"h x 18"w x 1.5"d stretched canvas. 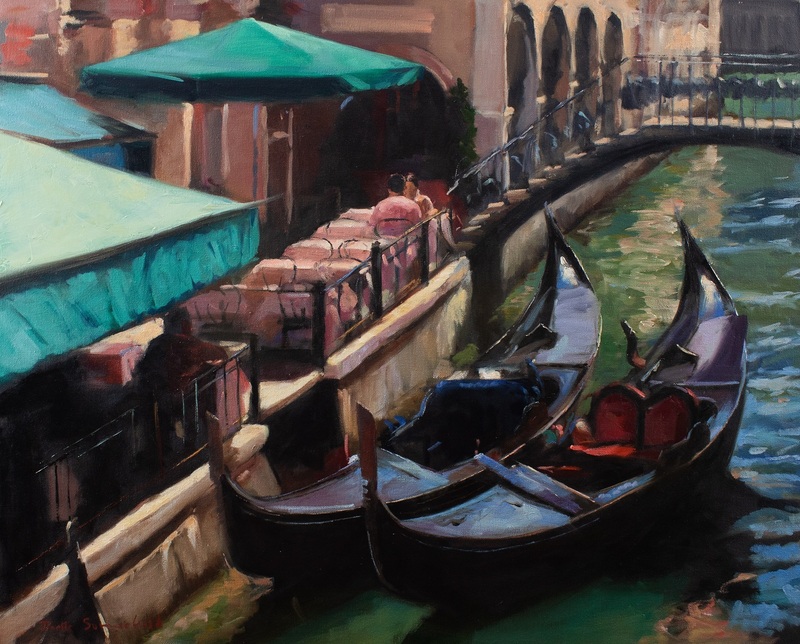 This painting is available through the Crate and Barrel | UGallery Artist Originals partnership! 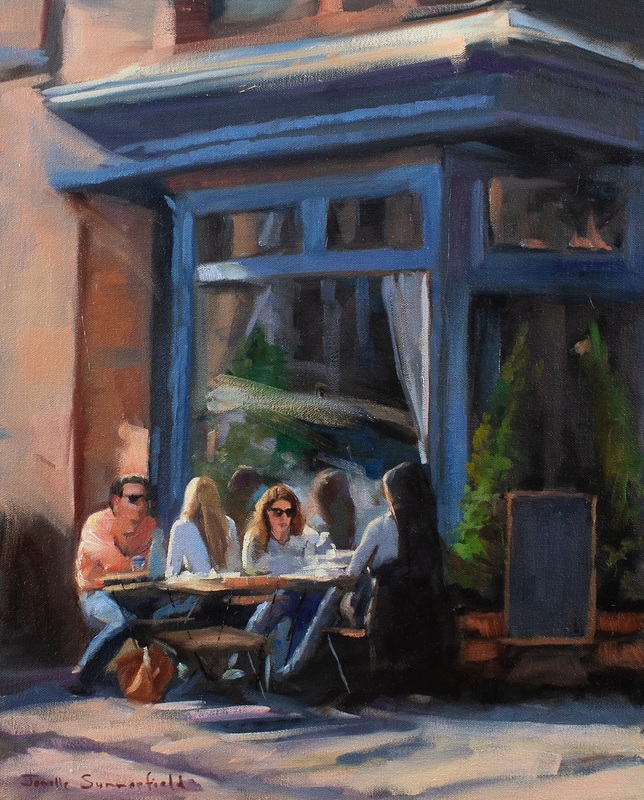 New Yorkers enjoying a sunny Friday with dinner and drinks outside. Oil on 20"h x 16"w x 1.5" stretched canvas. 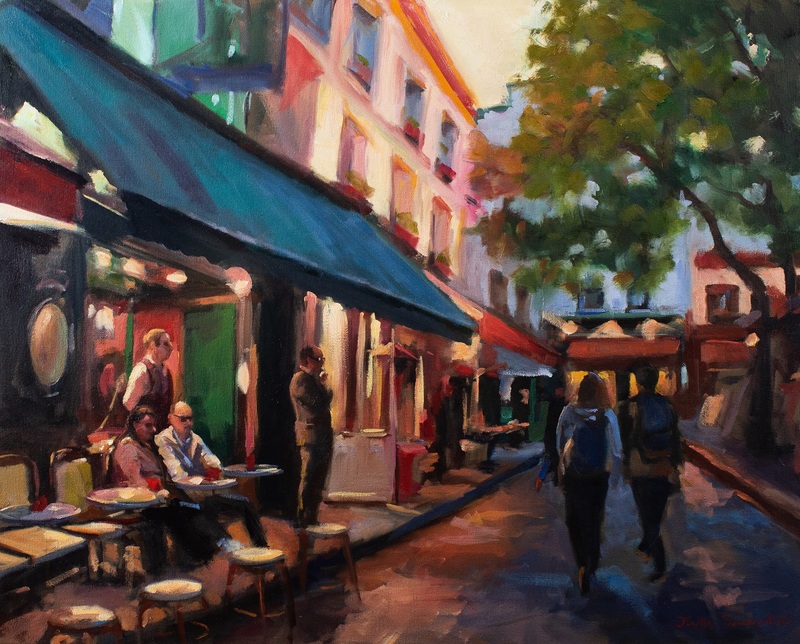 My favorite neighborhood in Paris on a sunny day. Oil on 20"h x 16"w x 1.5"d stretched canvas. 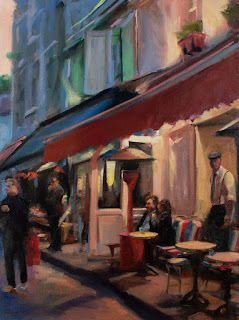 This is my favorite neighborhood in Paris. 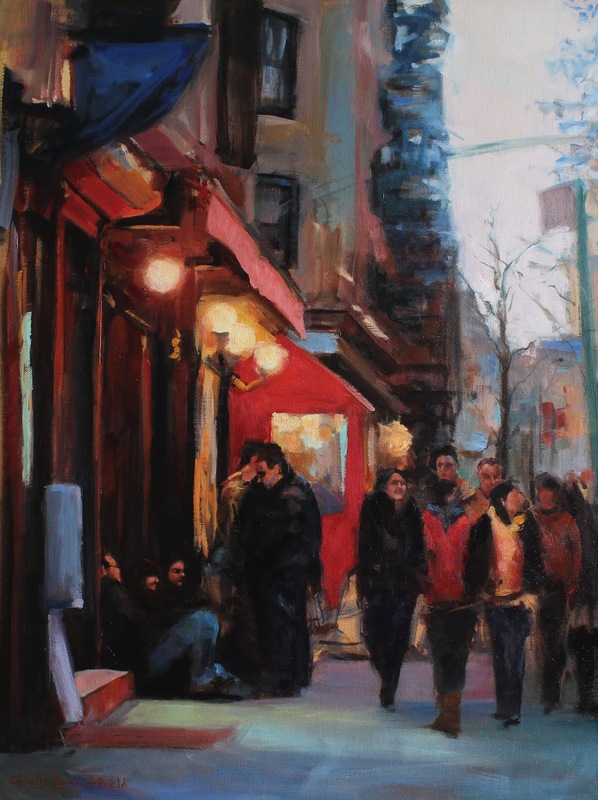 I love to wander the streets alone and absorb the atmosphere. When you walk with others, you have to compromise. Walking alone you can fully absorb the environment and have the freedom to visit any establishment you want for a meal or a drink. Oil on 24"h x 18"w x 1.5" stretched canvas. The street traffic in Montmartre is starting to wind down from the day, while the cafe lights have been turned on to prepare for the evening ahead. Oil on 24"h x 30"w x 1.5" stretched canvas. SOLD. 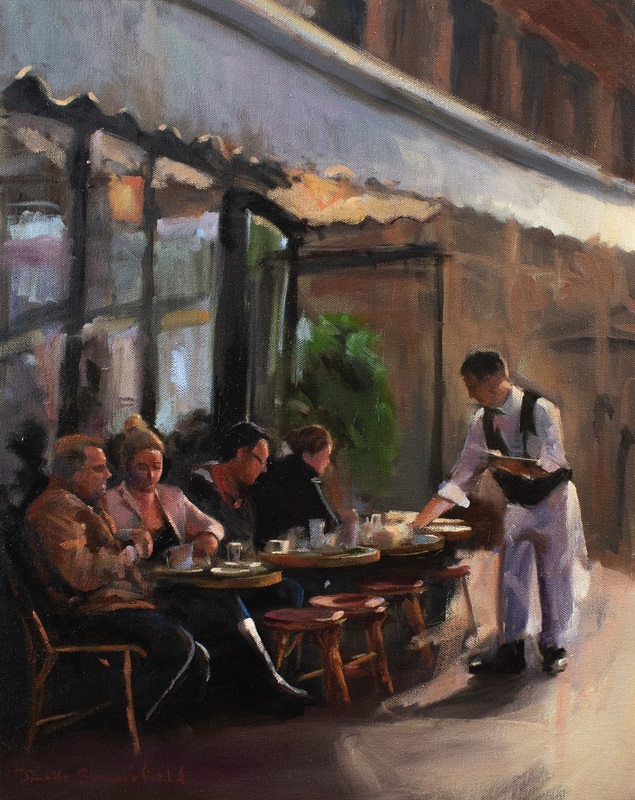 This is the equivalent of a sidewalk cafe in Venice, complete with a view of a "parking lot." Oil on 24"h x 30"w x 1.5"d stretched canvas. 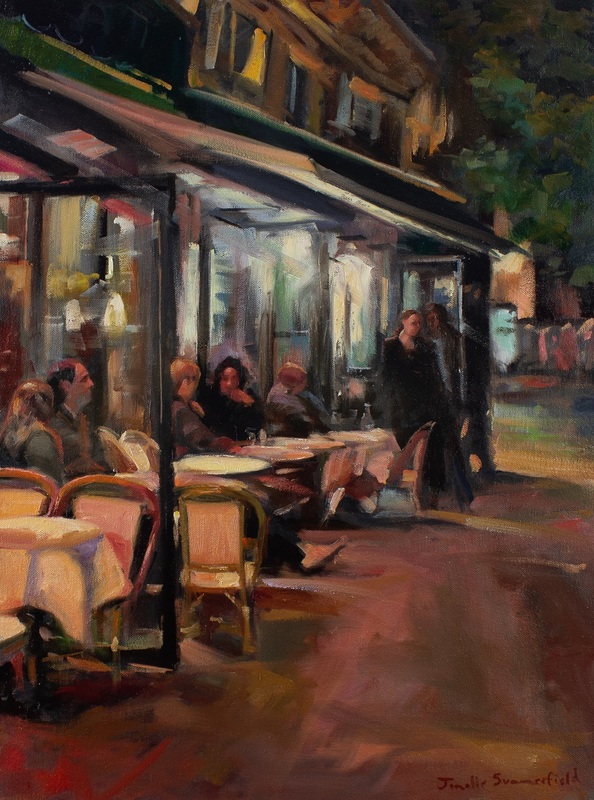 A painting of a sidewalk cafe during a busy spring night in Montmartre. Oil on 24"h x 18"w x 1.5"d stretched canvas. 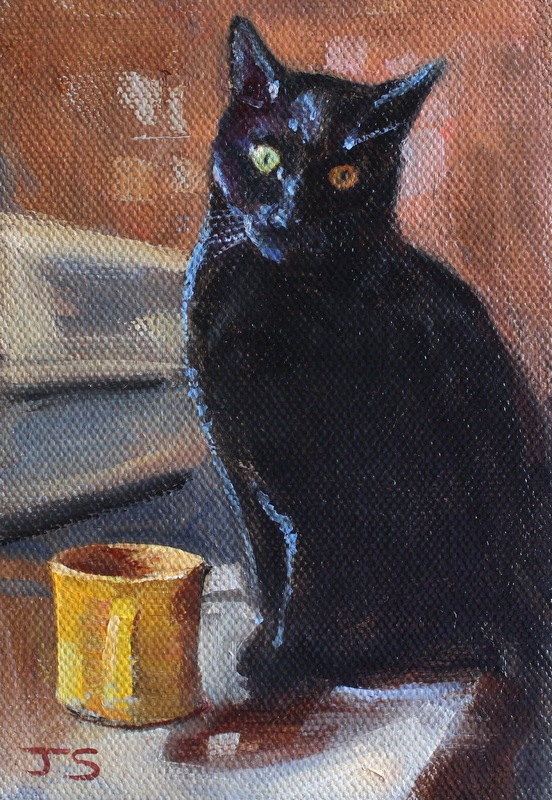 A painting of my sleek Alfred with his ears in the alert position. 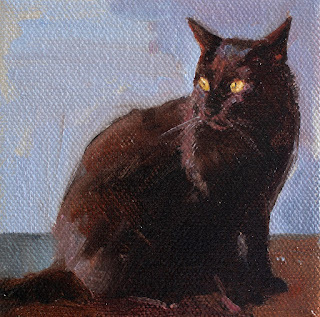 Oil on 4" x 4" stretched canvas. SOLD. 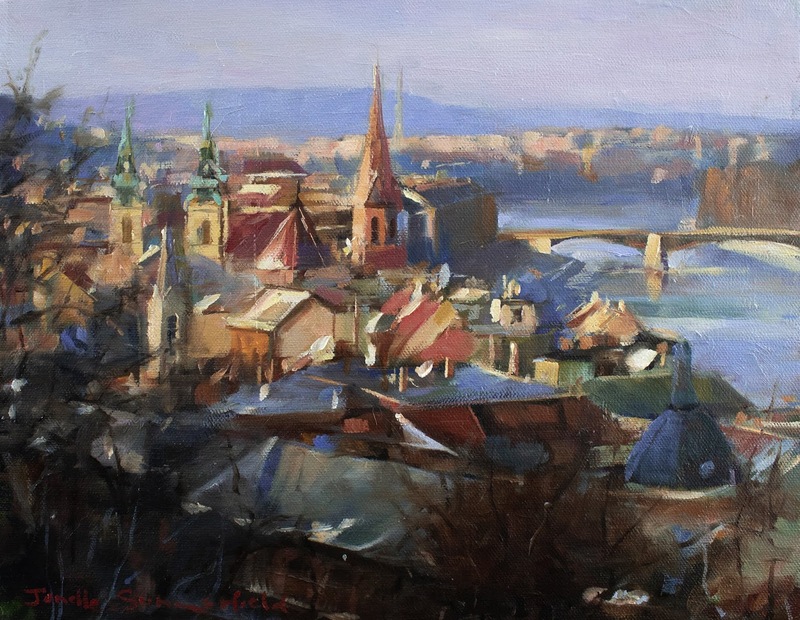 This painting as well as the following nine paintings were included in the Holiday Exclusive Mini Masterpiece Collection at UGallery.com. Many thanks to those who added my paintings to their collections! 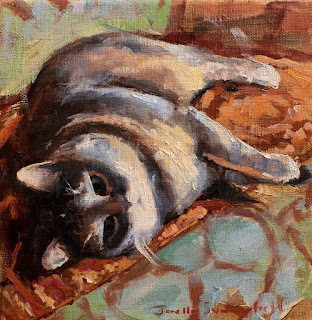 A painting of my sweet Oliver cat enjoying a bath. Oil on 4" x 4" stretched canvas. SOLD. 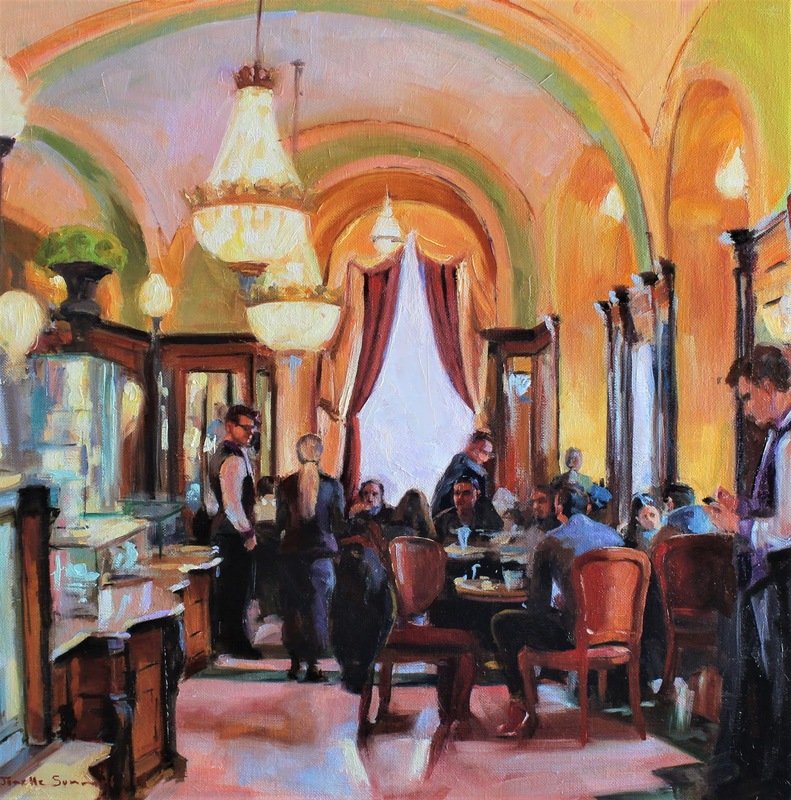 A painting of an espresso from a cafe in Budapest. Oil on 4" x 4" stretched canvas. SOLD. 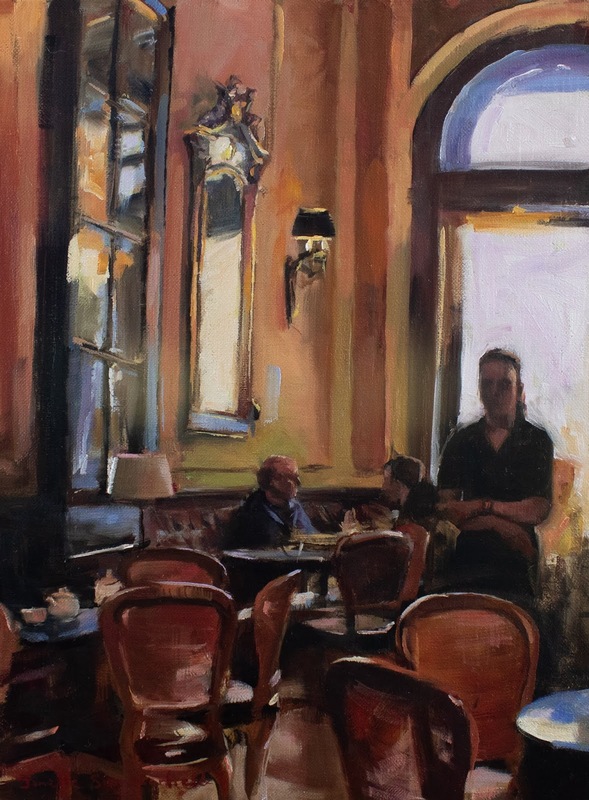 A painting of coffee and a biscuit that I enjoyed at Gerbeaud Cafe in Budapest. 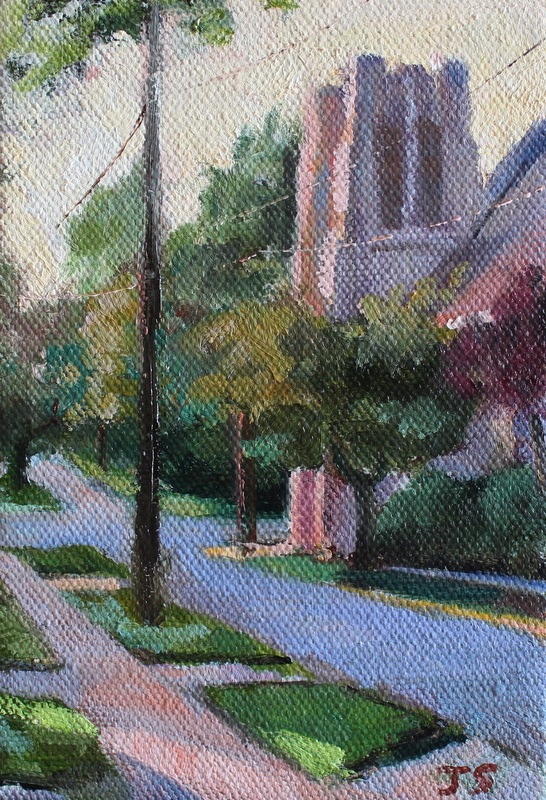 Oil on 4" x 4" stretched canvas. SOLD. 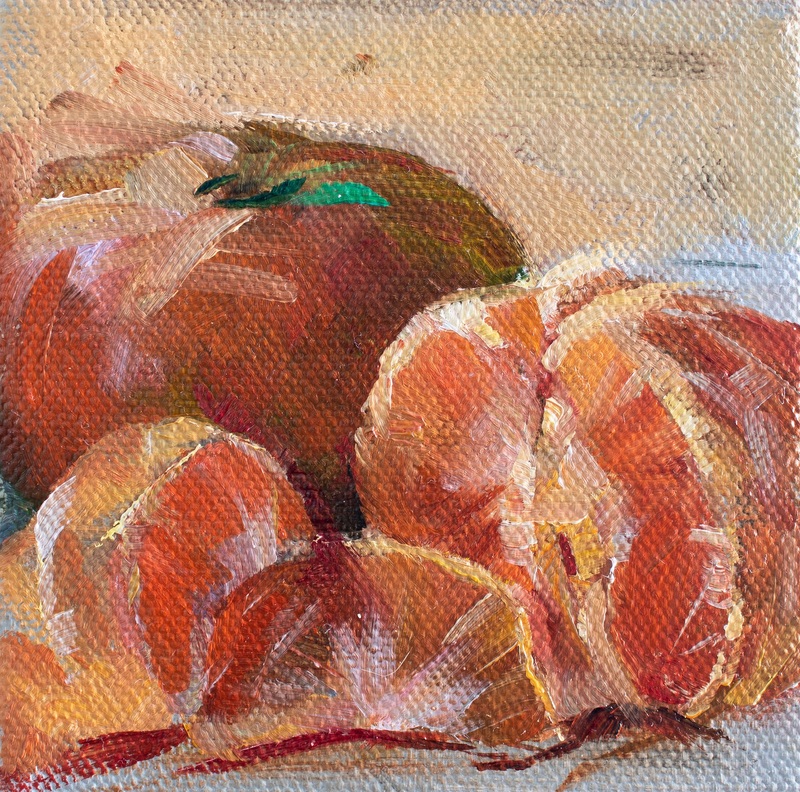 A painting of tangerines. I painted them from life, which I don't always do. Oil on 4" x 4" stretched canvas. SOLD. 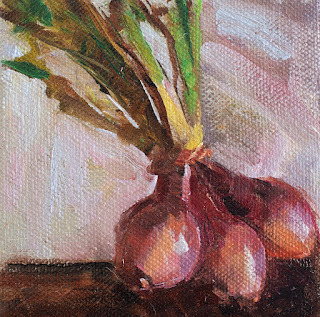 A painting of some red onions from my local farmer's market. 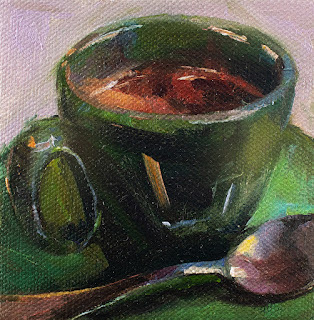 Oil on 4" x 4" stretched canvas. SOLD. 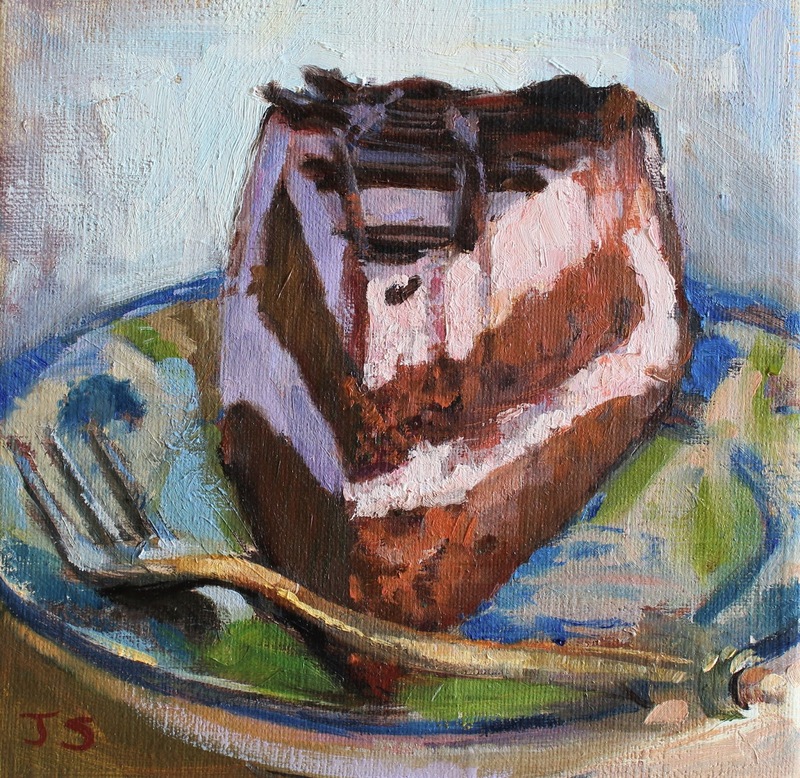 A painting of a mousse cake from Caffe Amadeus of Indiana, PA. Oil on 4" x 4" stretched canvas. SOLD. 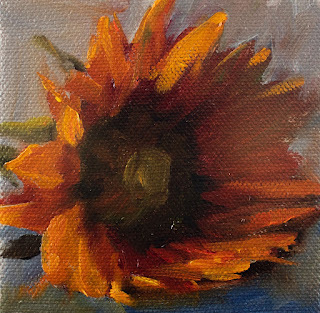 A painting of a sunflower from my local farmer's market. I didn't realize how many variations there are of sunflowers. Oil on 4" x 4" stretched canvas. SOLD. A painting of a sunflower purchased from my local farmer's market. Can't wait for next summer. Oil on 4" x 4" stretched canvas. SOLD. A painting of a cranberry cupcake from Market Street Pastries in Blairsville, PA. Oil on 4" x 4" stretched canvas. SOLD. This busy gelateria is located in Lucca, Italy. It was very hot and humid during my visit there many years ago, so frequent gelato stops were important. 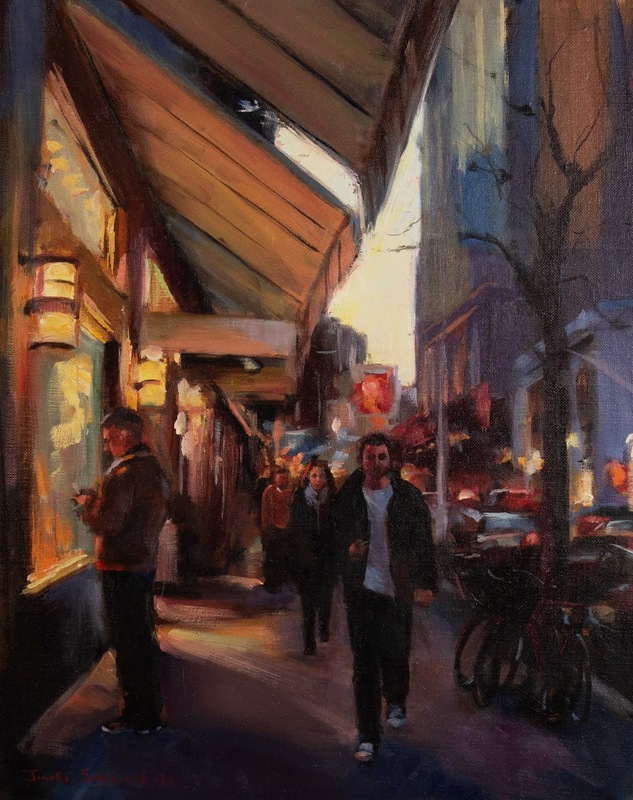 Oil on 24"h x 30" x 1 1/2" stretched canvas. 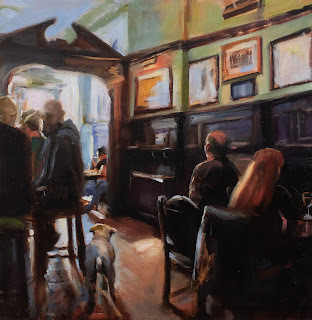 The only thing better than a Scottish Pub is a Scottish Pub with a dog in it. 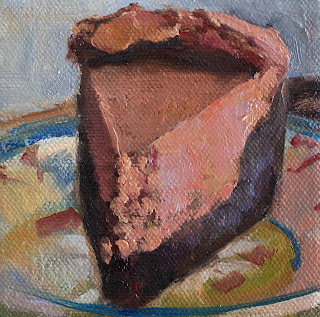 Oil on 12" x 12" x 1" masonite. This is a painting of Church Street of Indiana, PA at sunrise. 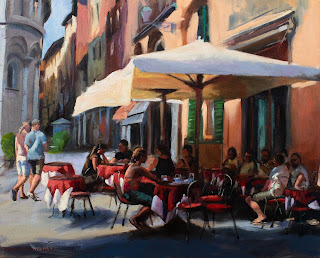 Oil on 16" x 20"h stretched linen. Oil on 24"h x 18"w stretched linen. SOLD. 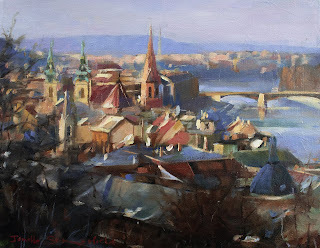 Oil on 20"h x 16"w stretched linen. SOLD. 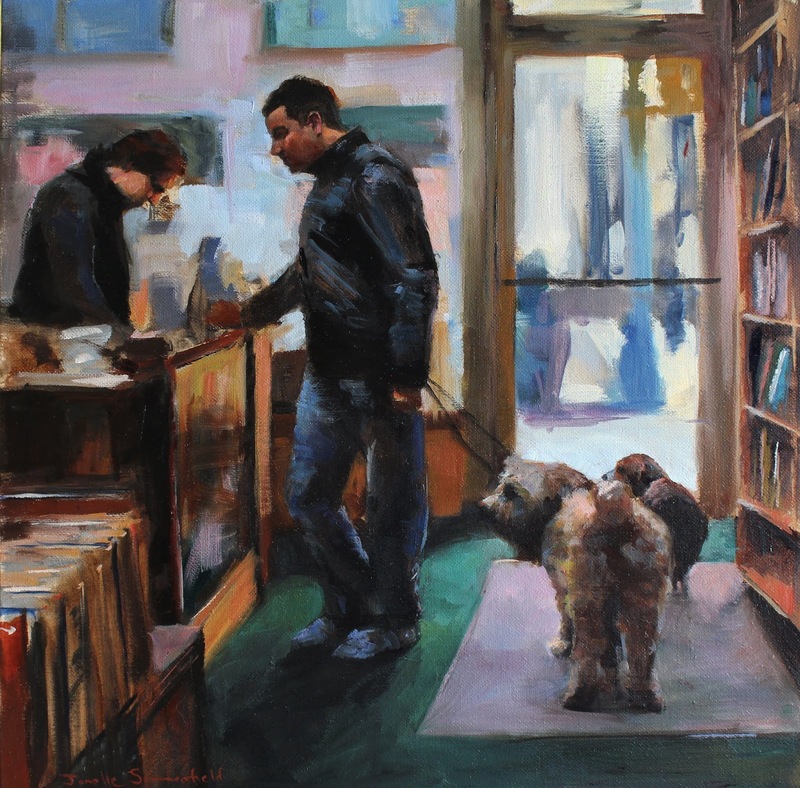 These dogs patiently wait while their human purchases some new books at a store in New York. 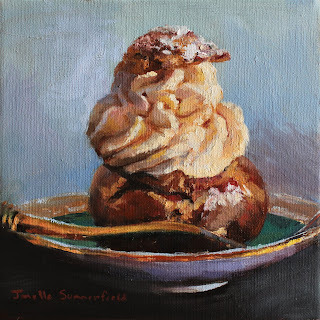 Oil on 16" x 16" stretched linen. A lady tries to decide what kind of crepe to order outside the walk-up window in Soho. My personal favorite is Nutella! 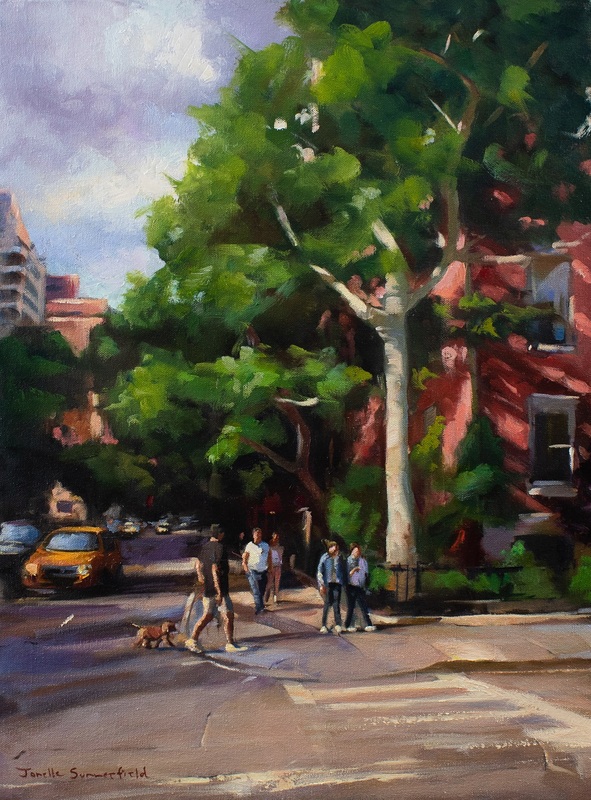 Oil on 12"h x 16"w stretched linen. SOLD. 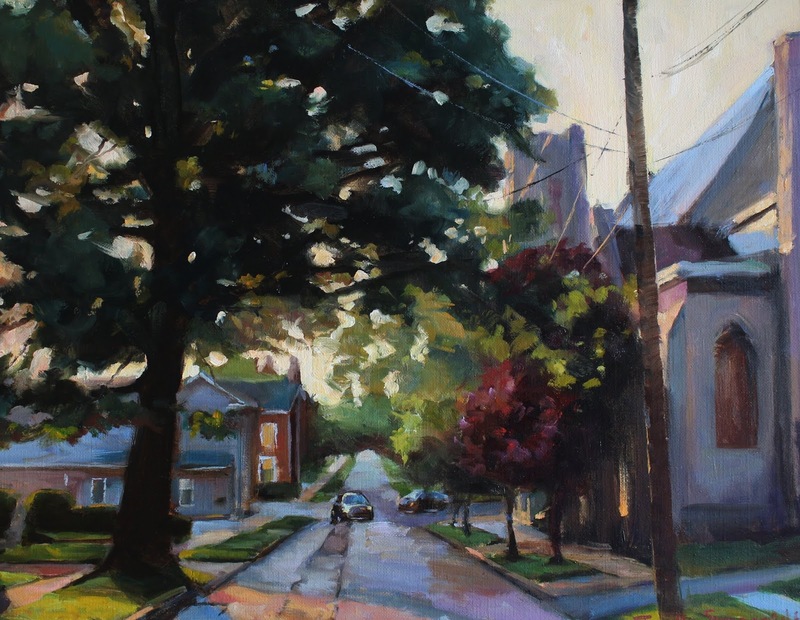 I painted this from a photo I took while taking a morning walk on Church Street in Indiana, PA. Oil on 11"h x 14"w stretched canvas. 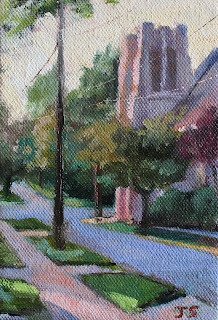 A painting of a church on Church Street of Indiana, PA shortly after sunrise. 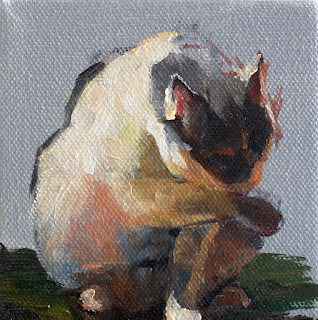 Oil on 6"h x 4"w stretched canvas. A painting of my distinguished cat, Oliver. He was the perfect model. Oil on 6"h x 4"w stretched canvas. SOLD. My Alfred likes to hang out on the kitchen countertop. He even eats his canned breakfast and dinner up there, away from Stella who always tries to steal his food. 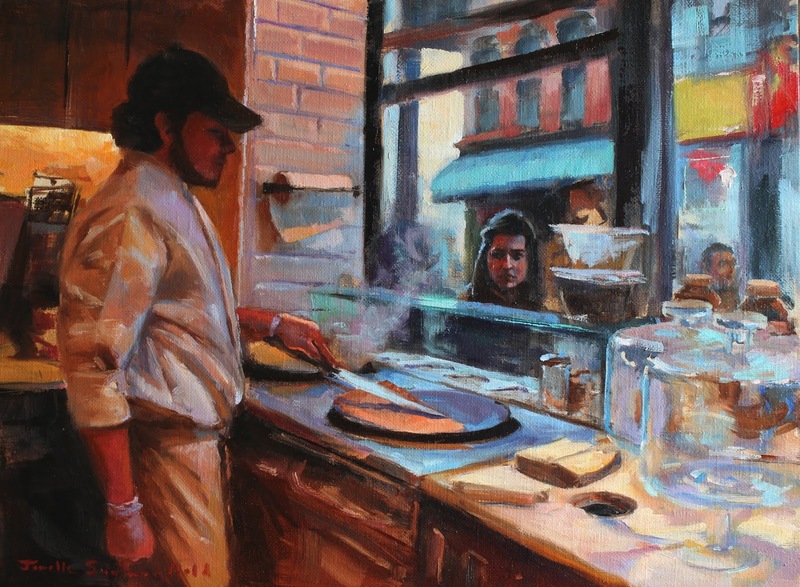 I painted this from a photo I took while preparing both of our breakfasts one morning. Oil on 6"h x 4"w stretched canvas. SOLD. 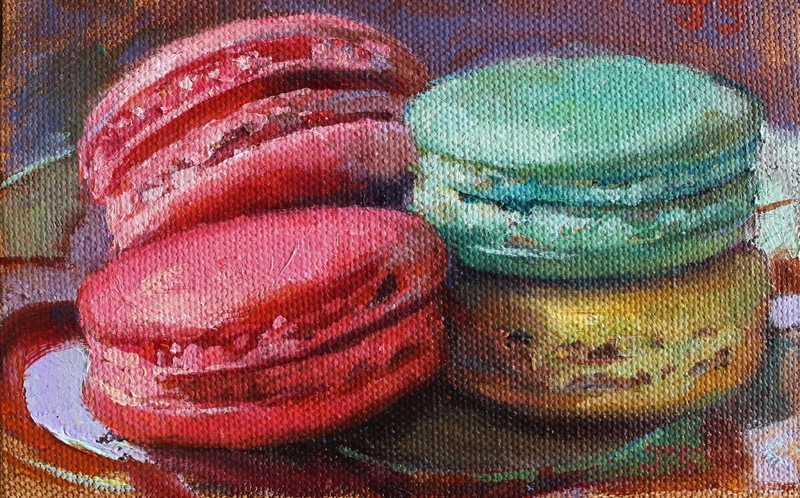 A painting of two macaroons from Gaby et Jules of Pittsburgh, PA. Oil on 4"h x 6"w stretched canvas. A painting of some antique teacups that I found at a local antique store. 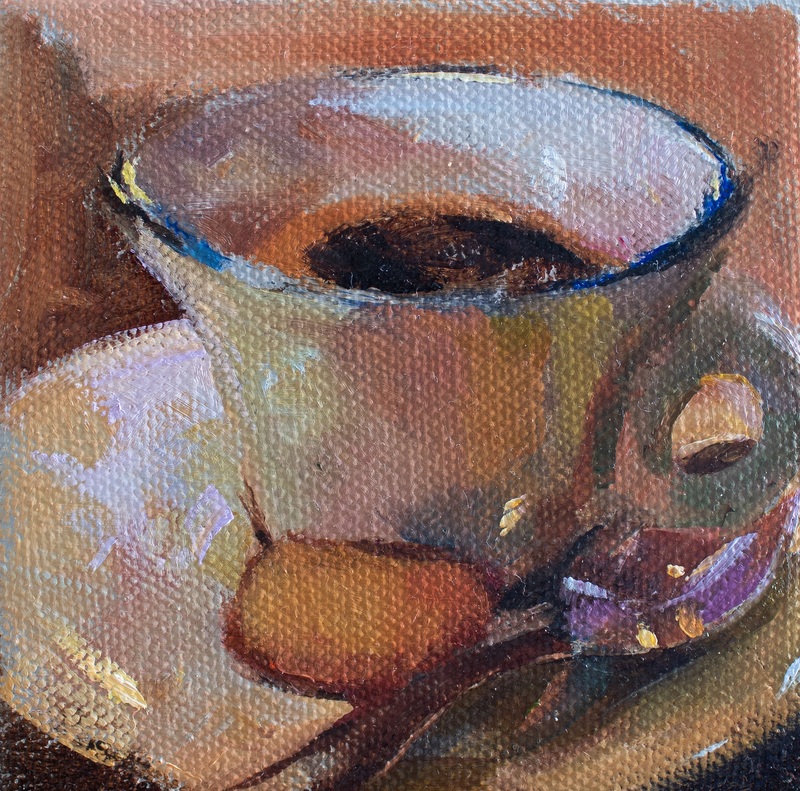 Oil on 6" x 6" stretched linen. 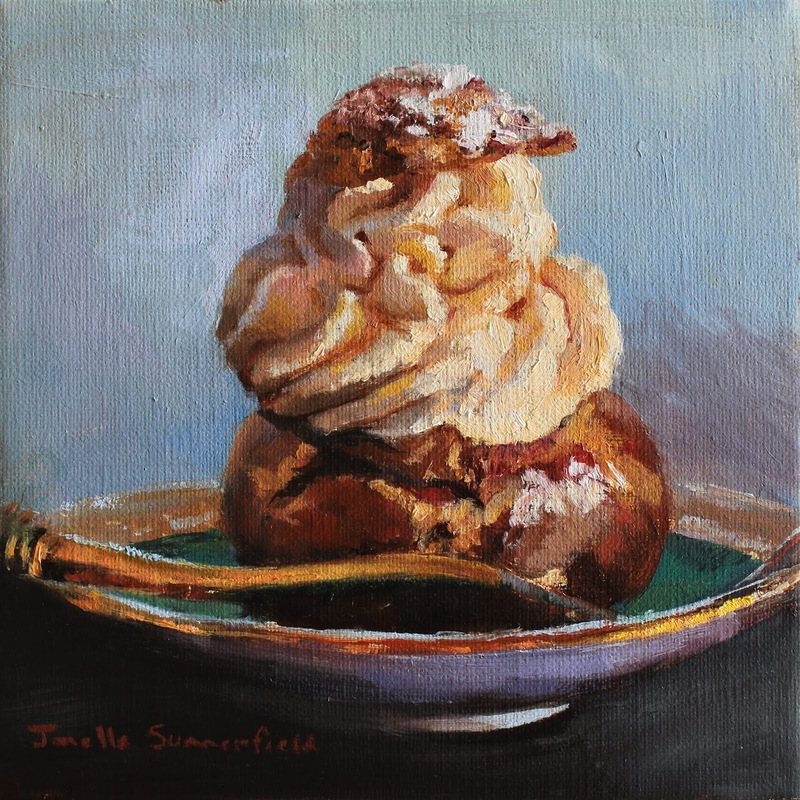 Available at the Artists Hand Gallery in Indiana, PA.
A painting of a cream puff, inspired by the fabulous desserts available at Six Hand Bakery of Indiana, PA. 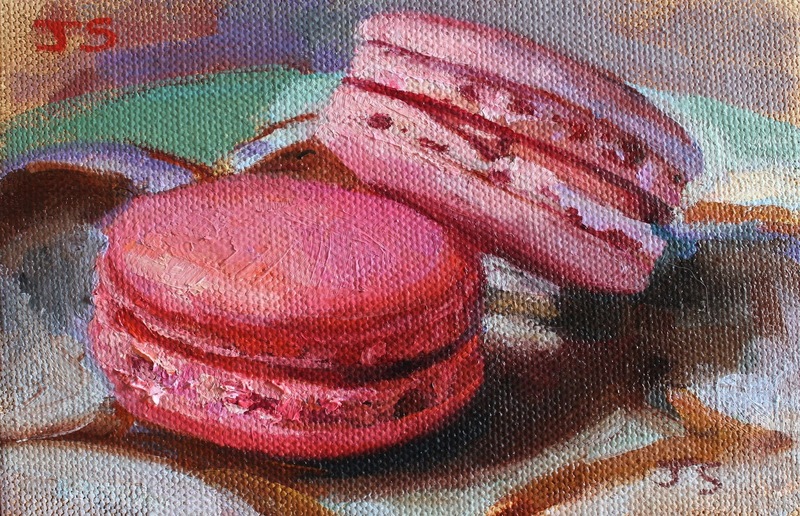 I started this painting from life, but ended up eating it halfway through, so I had to paint the rest from photos. Always buy two desserts when using them for subject matter... one to eat and one to paint. Oil on 6" x 6" stretched linen. SOLD. 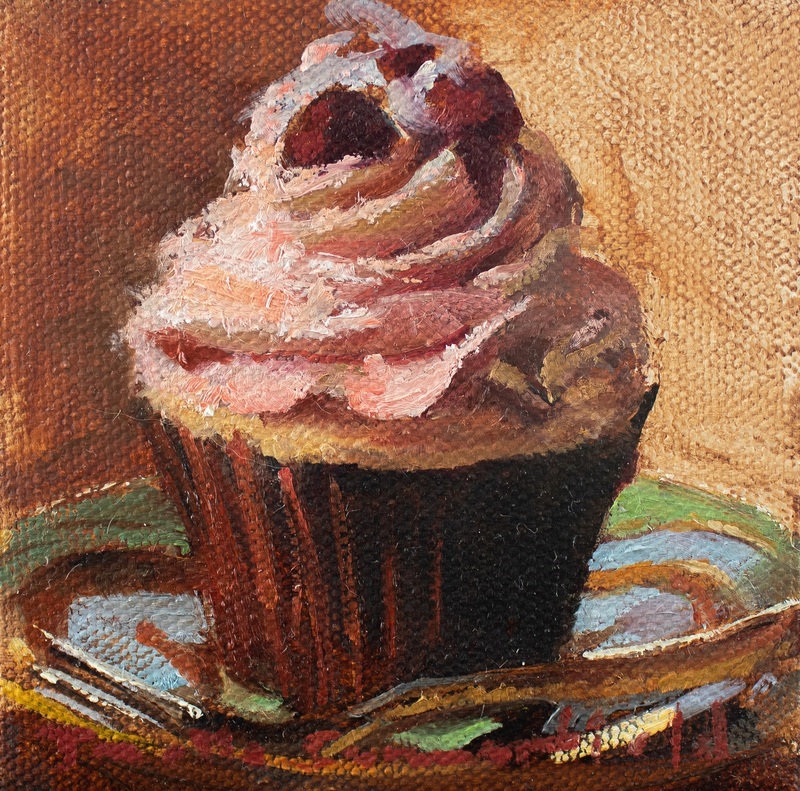 This painting was inspired by a cake made by Caffe Amadeus in Indiana, PA. Oil on 6" x 6" stretched linen. 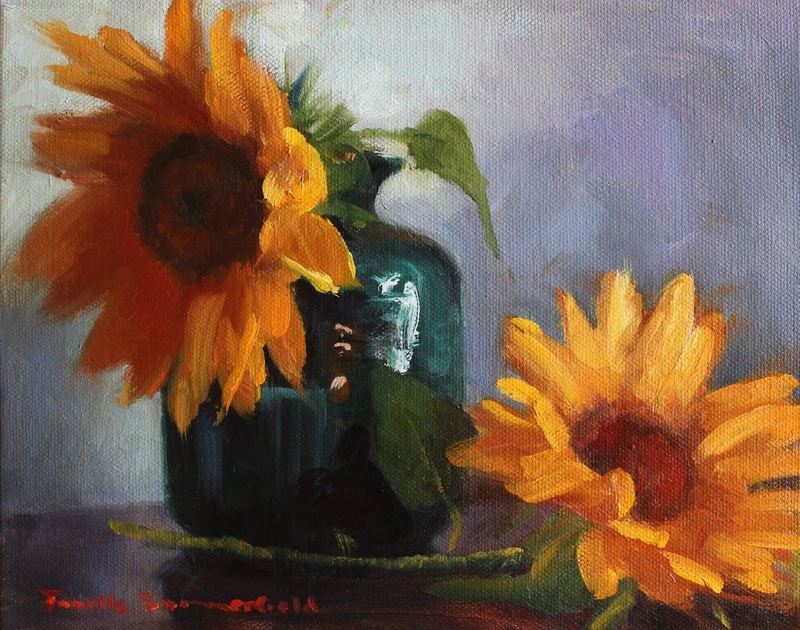 A painting inspired by some sunflowers I purchased at the Indiana, PA Farmers' Market. They are one of my favorite flowers to paint because I don't feel the need to get too nitpicky with the details. 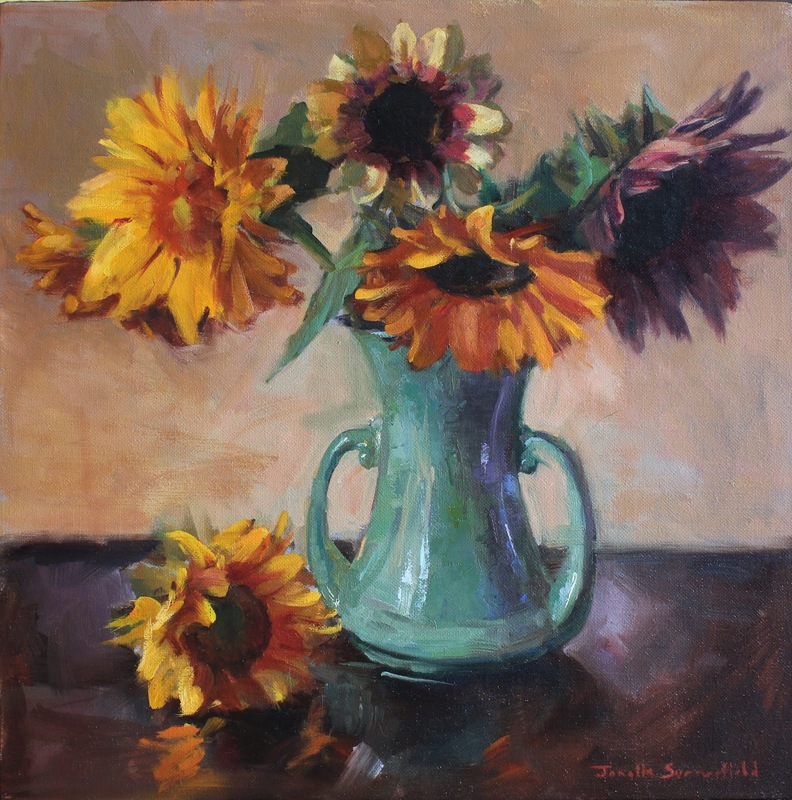 Freely applying big masses of yellow, red, black and sometimes purple creates the impression of the flower that seems free in itself. Oil on 16" x 16" stretched linen. SOLD. 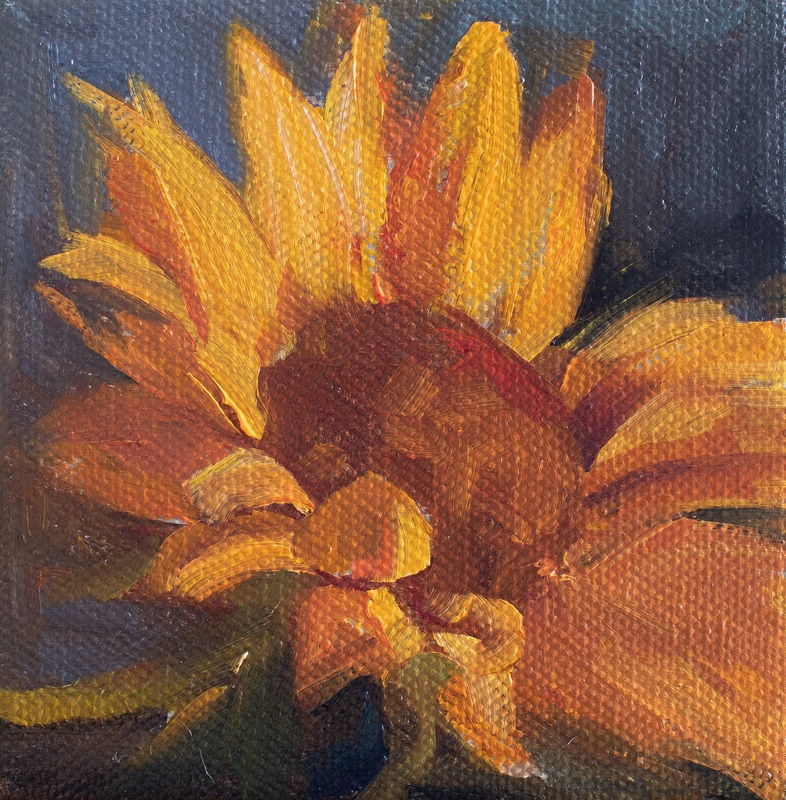 This was inspired by some sunflowers that I picked up at our local Farmers' Market. Oil on 8"h x 10"w stretched canvas. SOLD. 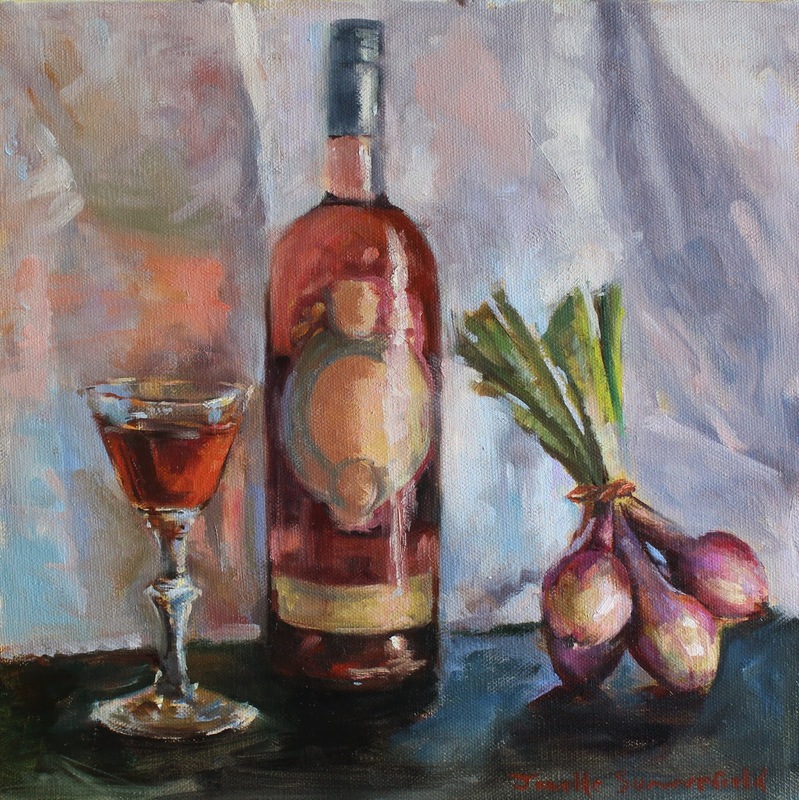 While one probably wouldn't want to pair onions with rose' wine due to their overpowering taste, I loved how the purple and green of the onions coordinated with the orange-pink of the rose'. I discovered the onions at our local farmer's market and thought they would be a good addition to my current exhibit at the Artist's Hand Gallery of Indiana, PA. The exhibit runs through October 22nd. SOLD. I usually paint from photos because my subjects often include travel scenes or things that move, such as people. 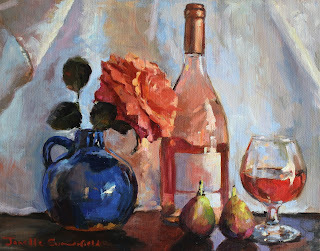 Recently I was in the wine store and I saw a lot of pretty bottles of rose' wine and thought they would be great in paintings. We are lucky to have a great farmer's market in our town on weekends where I've been finding flowers and veggies to include. Because my only time limit for still lifes was the life of the rose and the figs, I could take my time and actually paint my recent still lifes from life. Oil on 11"h x 14"w stretched linen. SOLD. A 4" x 6" tiny painting of four macaroons, inspired by Gaby et Jules in Pittsburgh, PA. 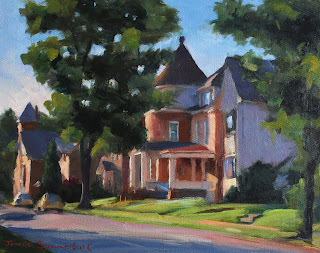 There will be paintings similar to this one at my show, "New Work by Jolene Joyner and Jonelle Summerfield" at the Artists Hand Gallery in Indiana PA. 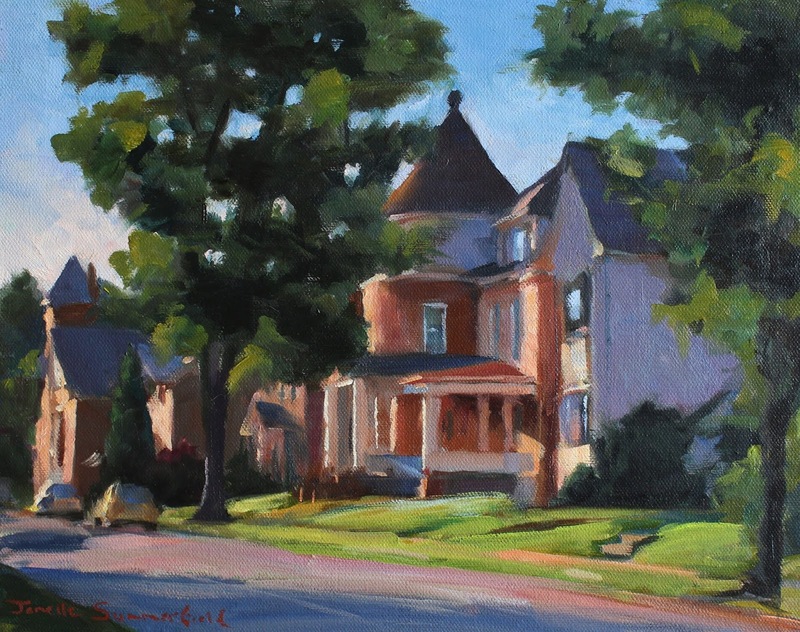 The reception is this Friday from 6-8 pm, and the show will remain at the gallery until October 22nd. SOLD. 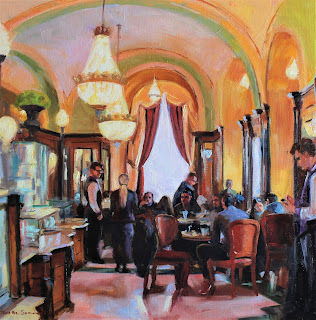 I painted this from a photo I took during our visit to Cafe Gerbeaud in Budapest. We had to go there twice so we could try twice as many desserts. 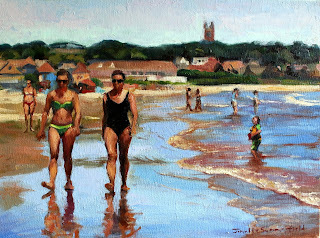 This painting will be on exhibit at The Artist's Hand Gallery in Indiana, PA. The show starts tomorrow and goes through October 22nd. Oil on 20" x 20" stretched linen. A friend commissioned me to paint this picture of her husband and son sparring during a Jiu Jitsu class. This is my first painting using the martial art as subject matter, and I like painting the drapes of the Gi uniforms. I hope to paint more soon! 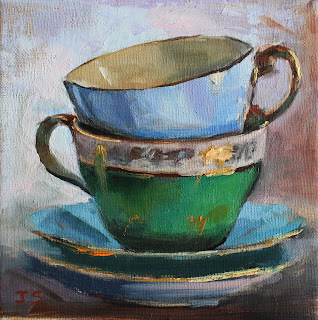 Oil on 14"h x 12"w stretched linen. The boulders and close proximity to mansions add charm to Gooseberry Beach of Newport, RI. Oil on 12"h x 16"w Masonite. SOLD. 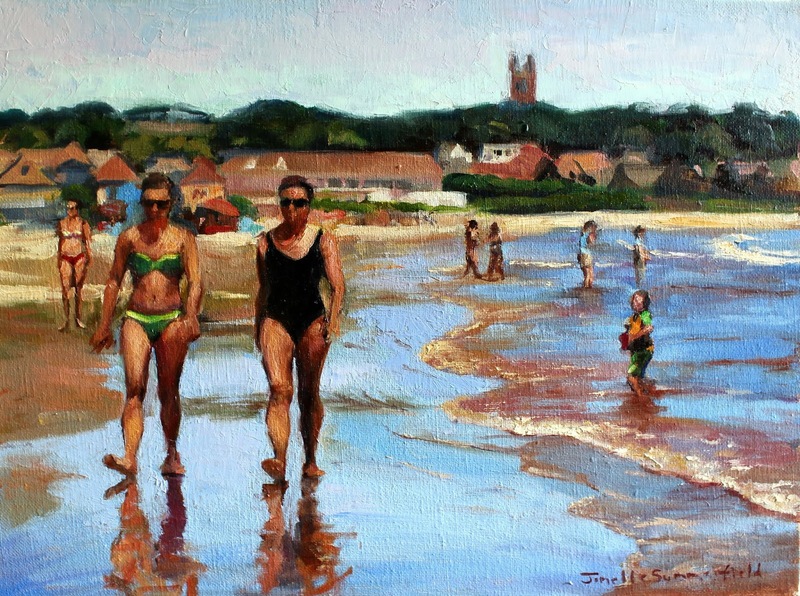 Time for a leisurely stroll on Eastons Beach of Newport, R.I. The water has a red tint to it because of the seaweed, which I've never seen on any other beach. Oil on 12"h x 16"w x 1" stretched linen. A painting of Coach Randy of Elite Combative Systems shadowboxing. Oil on 24"h x 12"w stretched canvas. One of my fellow students at Elite Combative Systems of Indiana, PA wraps his hands to prepare for kickboxing class. Oil on 30"h x 15"w stretched canvas. 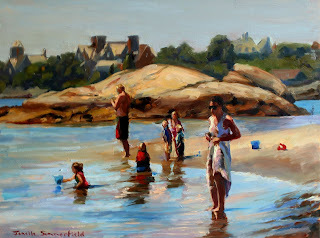 I paint most of my paintings from photographs. I took the reference photo for this one at Elite Combative Systems in Indiana, PA. Sal's hands were a bit too fast for my slow camera, so I used that to create a sense of movement. 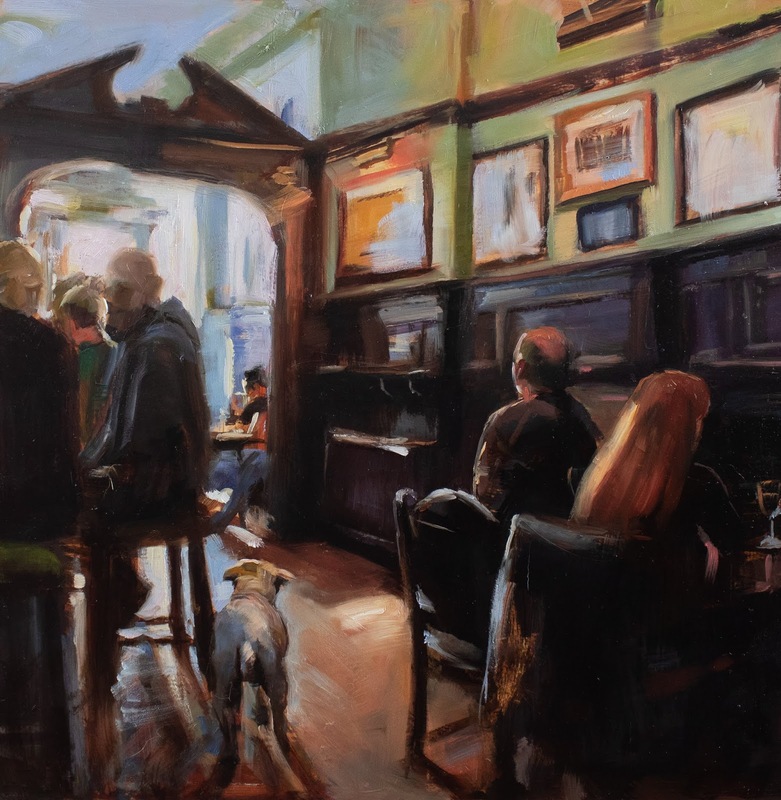 Oil on 24"h x 18"w stretched linen.